Sudan has the largest irrigated area in sub-Saharan Africa and the second largest in all Africa, after Egypt. The total estimated area fully equipped for irrigation is 1,764,635 ha and an estimated cropped area of 1,148,665 ha, i.e. an estimated cropping intensity of 65%. The irrigated sub-sector contributes more than 50% of the total volume of the agricultural production although the irrigated area constitutes only about 11% of the total cultivated land. It has become more and more important over the past few decades as a result of drought and rainfall variability and uncertainty. The irrigated sector produces 95% of the long stable high quality cotton produced, 100% of sugar production, 36% of sorghum and 32% of groundnuts. Other main irrigated crops are fodder, wheat and vegetables with other crops comprising maize, sunflower, potatoes, roots and tubers and rice. Irrigated agriculture falls into two broad categories: traditional and modern schemes. Traditional irrigation is practiced on the floodplains of the main Nile downstream of Khartoum and on substantial areas along the Blue and White Nile, and the Atbara river as well as on the Gash and Tokar deltas. Many schemes are fully equipped with infrastructure but have low cropping intensity due to scarcity of water during the long dry season. Large-scale gravity irrigation started more than 100 years ago and was characterized by the promotion of cotton production in the Nile Basin. Irrigation by pumping water began at the beginning of the 20th Century, substituting traditional flood irrigation and water wheel techniques. The Gezira Scheme is Sudan’s oldest and largest gravity irrigation system, located between the Blue Nile and the White Nile. The scheme together with its extension of Managil scheme with a total equipped area of 846,772 ha is the largest single scheme in Sudan and one of largest irrigation schemes in the world. 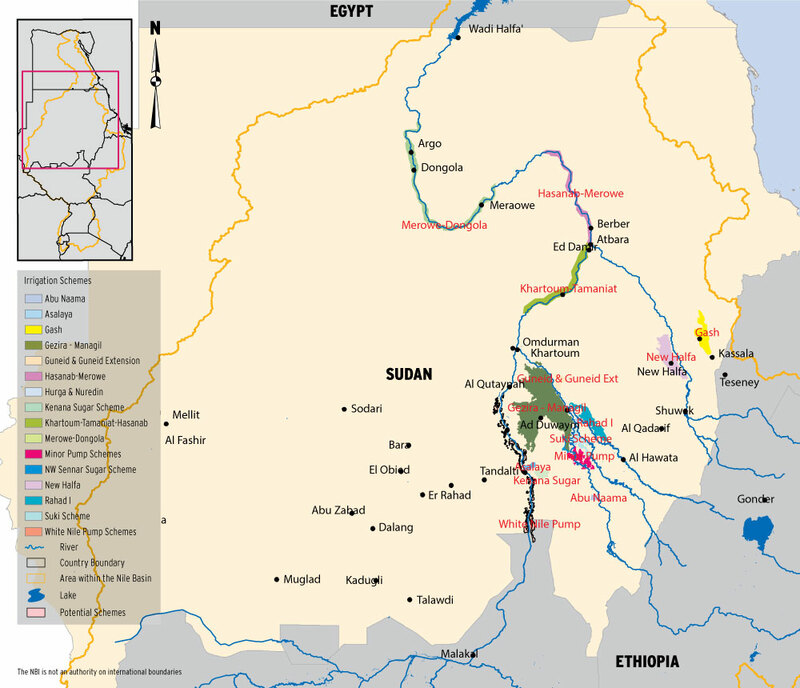 Nearly 75% of the total irrigation area is in the Blue Nile sub-basin in Sudan. Started in 1925 and progressively expanded thereafter, it receives water from the Sennar Dam on the Blue Nile and is divided into some 114 000 tenancies. The total net abstraction of water for irrigation from the Nile system is estimated at 13.3 BCM per year. The lion’s share of this amount is taken by the Gezira – Managil scheme with an estimated withdrawal of nearly 6.5 BCM followed by the New Halfa scheme with annual net abstraction of about 1.5 BCM.